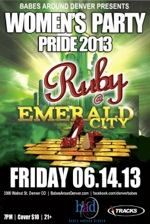 Enter the magical world of Oz for “Ruby” – Denver’s official Pride weekend party for women. Babes Around Denver proudly hosts the largest Pride Party for Women at Tracks. Last year, more than 1500 women celebrated Pride at Denver’s largest LGBT club.